I found lots of felt from different places in the room. I guess I collected them over the years little by little. I started to line them up and color-coordinate them. Looking at them made me wanna make something...and I actually started cutting them today. I will post the finished item with a tutorial soon! This week passed by in the blink of an eye for me. There is something I am working on but I can't reveal it ‘till March. I have been trying to squeeze the time to work on that into my schedule... and it has been fun! When I am focused on a project, I forget to eat or drink. Time flies by so fast! I have to make an effort to keep looking at my watch, so I won't miss my children’s pick up time. Another thing I have been doing is to slowly reorganize my house. I have been working on each room, going through the closets and cupboards. I usually have three bags for "Sale", "donate", and "throw away". Sometimes if I am in the "zone", it's easy to part with the things and the clean-up goes fast. If I am not so much in the zone, my mind is blank, don't know where to put what. The whole thing takes a long time too. 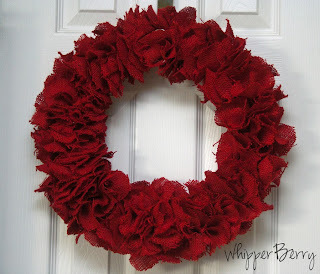 This is one of those Valentine’s crafts I just mentioned...Fast Daze shared a really fun Wreath, inspired by Tatertots & Jello. She also used the tutorial from “A girl and Glue Gun” to make felt flowers. How colorful and pretty! Holy Cow!! Talk about big project, I mean, really BIG. Backwoods Cottage shared a STUDIO she built with her husband. Yeah, you heard (read) right. A STUDIO! She posted the step by step photos on her blog, so head over there to check them out! I would love to see the picture of it all moved in and decorated studio too! Amazing job! You Seriously Made That? shared this pretty headband. 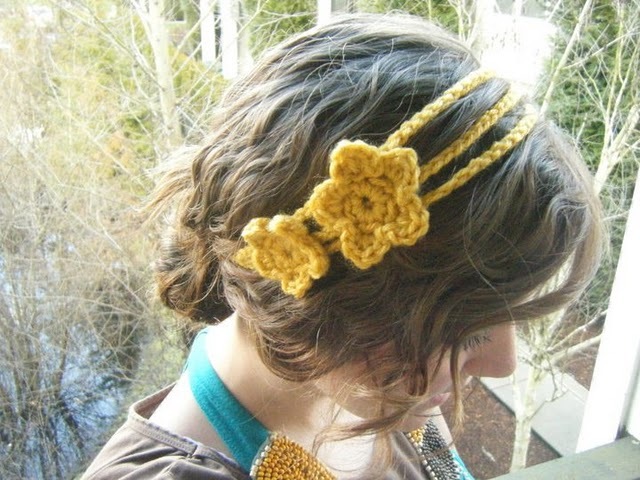 I have seen many crocheted headbands before, but I really like this style and the colors of the yarn. Great job! When I saw the picture of this plate, I was in LOVE! 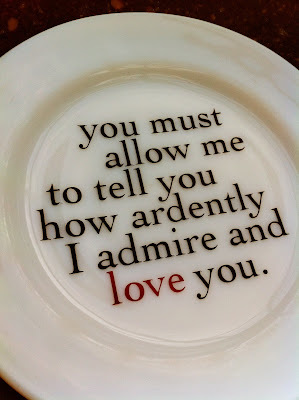 I love Jane Austin and Mr. Darcy... Grey Luster Girl was inspired by Pottery Barn and created this plate. Sooo romantic! This is also a Valentine project, but without the usual red and pink. 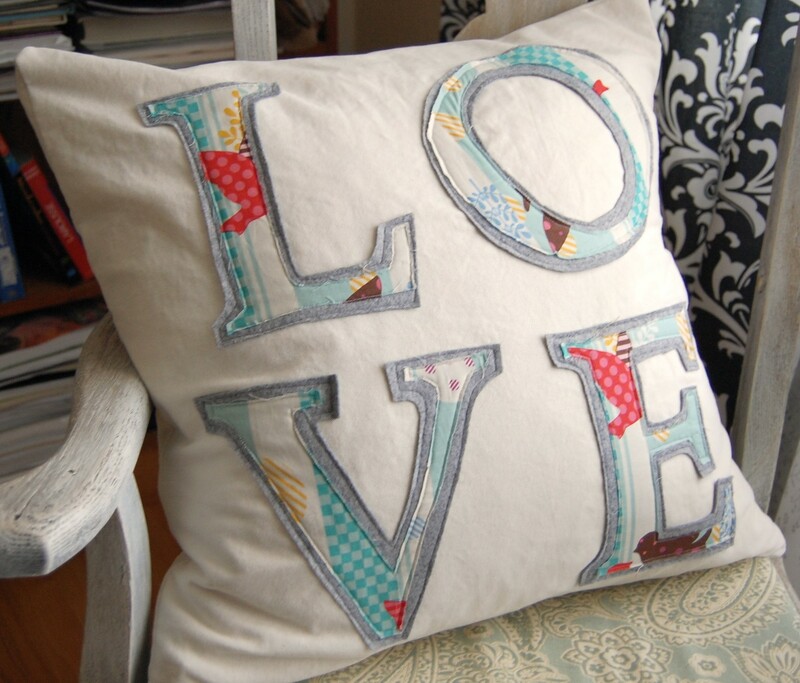 I love how A Crummy Marriage Blog layered the fabrics for the letters. What a fun way to make it more interesting! Thank you all for sharing your great projects! See you at the next post! I posted the winner for the Say it On the Wall giveaway on my sponsors' page. Don't forget to head on over there to see if you are the lucky winner! A few months ago, I found this wonderful item at Tuesday Morning for a really great price. So many beautiful cork flowers in different colors and sizes...I love the wooden box with a glass top that slides open too. I can use the box for a display box, when I am all finished using the flowers. I guess I could use the flowers pretty much for anything. Scrap books, card making, making hair accessories, decorating frames and so on. Hmmm... What shall I make? I look at them, stuck them up, and lined them up to form some ideas for now. I think this is one of the fun parts of making something. With this many flowers, maybe I can bring an early spring in my house. I have been staying low...it's been about three weeks, and I still haven't gotten over this cold! I went through the whole symptoms like, cold chills, aches, fever, and so on. I took antibiotics and thought that everything is over... boy was I wrong. I think I have whole other thing now. Massive cough, and sneezing, followed by aching and fever... Holy cow! I am still functioning though. Well, three small kiddos clinging how can I not. I thought if I am up doing things, might as well, do something fun and take my mind off of these annoying flu symptoms. I made a new liner with a type of polka dot pattern fabric. It is removable for washing, and has drawstring to close it shut. If I don't want to be bothered by opening and closing the fabric, I can always fold the fabric inside. I think it will be fun Spring/Summer basket. Whenever I do a basket makeover, the hardest part is parting from them. I put so much thought and effort into them; I can't deny feelings of attachment there. Since I don't live in a 100,000 square foot home, I can't keep everything. Thank you for your participation, and making this link party sucssesful and fun! I am doing a giveaway for my sponsor Say It On The Wall this week! Go to my sponsor's page to get to know them and enter for a chance to win the exciting prize! Oh, you guys! There were many great links and projects at my link party, I feel like there were a lot more than usual. It was very difficult for me to narrow it down to only five. But, I did what I had to do...I have my favorite five for this week! 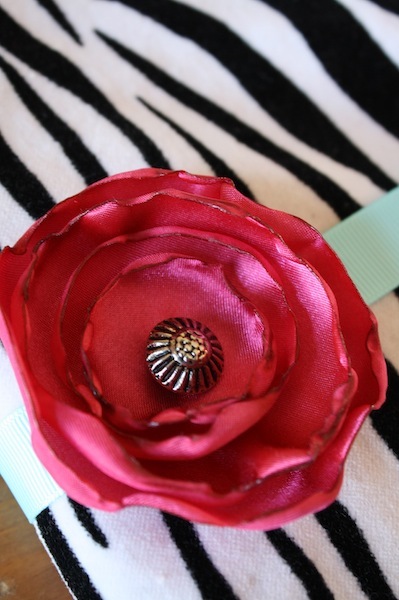 Look at this pretty and sassy pencil purse shared by All Things Beautiful! She used her daughter’s out grown jumper skirt to make this. What I like about this project even more is she didn't waste anything. The pretty pink flower was made out of the liner to embellish the purse. Her little girl will doodle with style! I love these assembled boxes! Can't Stop Making Things was inspired by Joseh Corhell's work and made these stunning and unique pieces of art. How fun to see the things in the boxes...I would love to try making something like these. 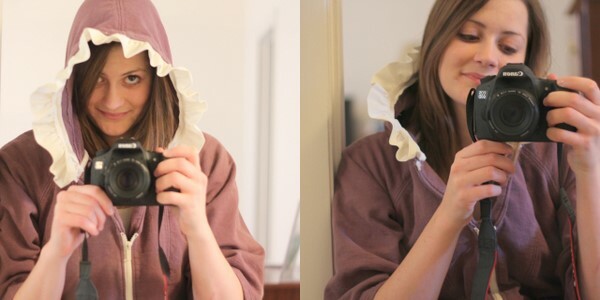 I was so excited to see this Ruffle hoodie by See Kate Sew. The last couple years, ruffles have been one of the "in style" things. I see ruffles everywhere. But now, I think the trend is gradually shifting to something else. I don't care if I am "in style" I love ruffles so much that, I would feel so sad if they go away completely. I will be making ruffley things forever! Anyways...I love how Kate used ruffles in a whole different way. So cute! Rosy Red Buttons reveals her nursery makeover! 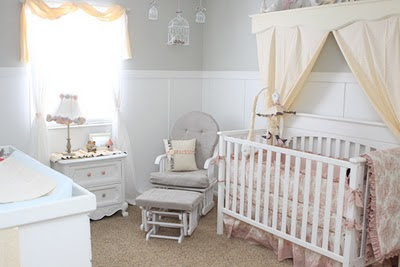 There were so many pretty items that she handmade herself in the nursery. I love the color scheme, and the little details she added for her baby girl. I feel a mother's love for her baby from every inch in this nursery! 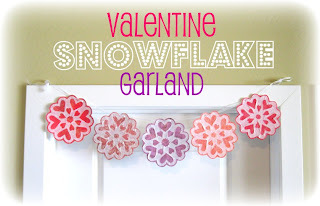 Are you looking for something inexpensive and fun to make as a Valentine’s decoration? 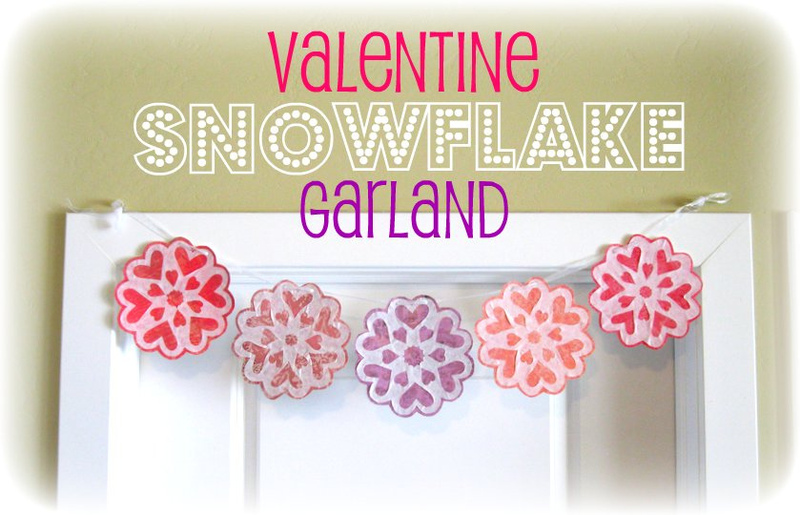 Peppermint Plum shares a tutorial on how they made the cutest Valentine’s garland with coffee filters. This project looks very fun and easy to do... perfect for a girls get together craft night! Thank you all for linking. I hope you will have a wonderful weekend! Note: I have a little surprise post on Monday... be sure to come back! The last post was about my wool projects. I mentioned that I would go to a thrift store and buy old sweater or wool clothes (100% wool), and make wool felt. Some of you wanted to know how to make wool felt. So, I found my old post that tells you how to do that. Then, you will have your wool felt. If you don't want to go through that whole process, you can always buy beautiful wool at most of the quilt stores too. Now that you have your wool, I will show you how I made the sweet heart hair clip for my daughter. 1. First, cut wool. One large (with pinking scissors), one medium, one small and three small circles. 2. Then, place the small circles on the small heart; sew them with using a slip stitch. Sew three beads in the middle of the circles. Then, add pearls randomly. 3. Measure the hair clip, and make two small cuts on the largest heart. This way, you can slip both sides of the clip in the back of the wool later on. 4. Layer the small heart and medium heart together. Embroider leaves around the circle flowers. Then, lay them on top of the large heart and sew. 5. Put a dab of fabric glue on the end of the clip and slide it in to the cuts you made earlier in the back of the large heart. Wait until it dries completely. Ok, I admit it. It is BIG. I realized that when I put it on to her head. That will give me an excuse to make more of those, but a little smaller. What color combinations should I try next? Wool is such a fun material to work with. Sometimes I buy wool clothing at thrift stores, and treat it to make wool felt. Right now, I am having so much fun going through my wool scraps to form some ideas. What can I make next? Ok, everyone, it is your turn to show off what you have been working on! Link Love No. 38 / Giveaway Winner! I have the giveaway winners on the Sponsor's page! Hop over to see if you are one of the lucky winners! I noticed that there were many new faces at this link party. It is so fun to discover more talented people and fun blogs (well, I admit it, that made it harder for me to pick five "love's" for this week! I had to feature these bowls. Can you believe it? They are made out of magazines! Eye Spy DIY has the link to the tutorial for this on her blog. This might be a fun project to work on with kids too. I always have many art projects ready for the summer for the kids, and it can get expensive. This project is pretty much free! How nice is that? 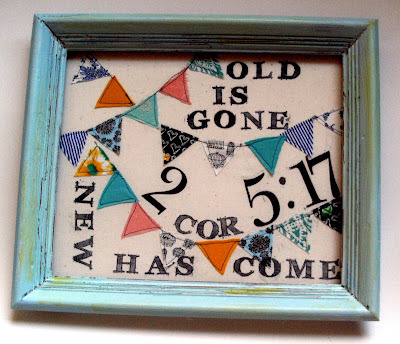 Cottage Hill shared this AMAZING project with us. I love the armoire as is, but she transformed it to a sewing cabinet. This is perfect for someone who doesn't have a lot of space. Great job! Check out this unique wall art! 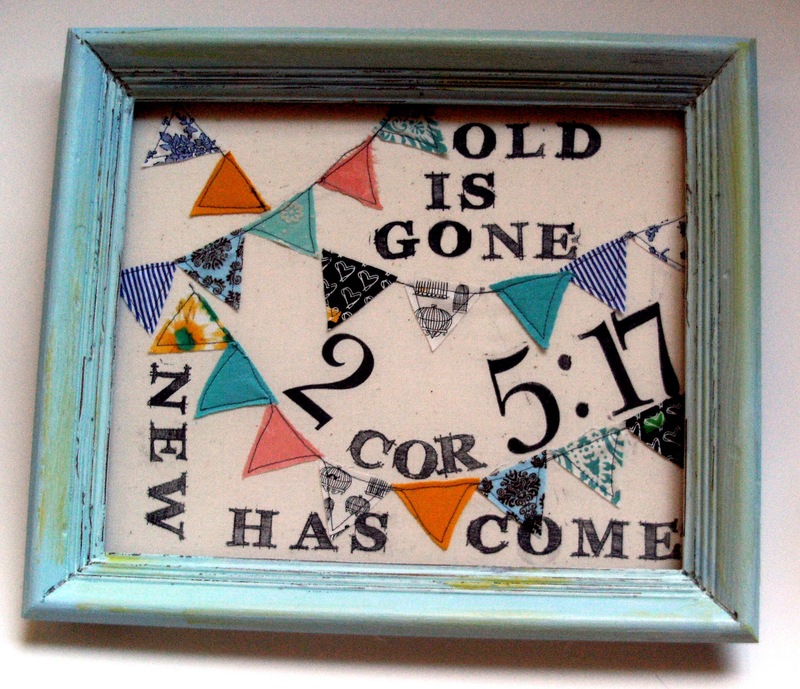 Mandipidy shared how she made this bunting banner wall art. It looks like someone has a gift for coordinating colors and design. I love LOVE this piece of art! While I was visiting House to Your Home, I was "oooh" and "ahhhh" ing the whole time. 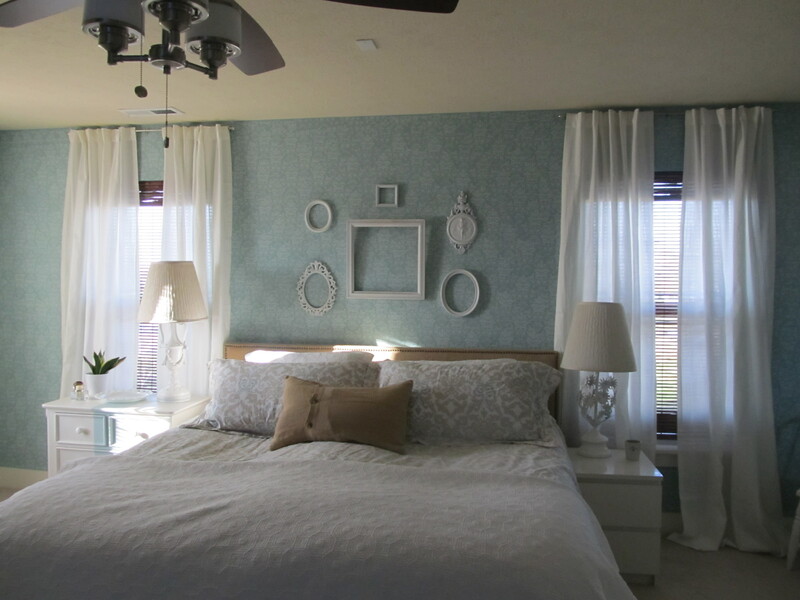 I love how she put everything together in her master bedroom. The room has a sense of clean, peace and serenity with style. Oh, I love the lamp shade too! Can I just move in? I can't believe it is already the middle of January! 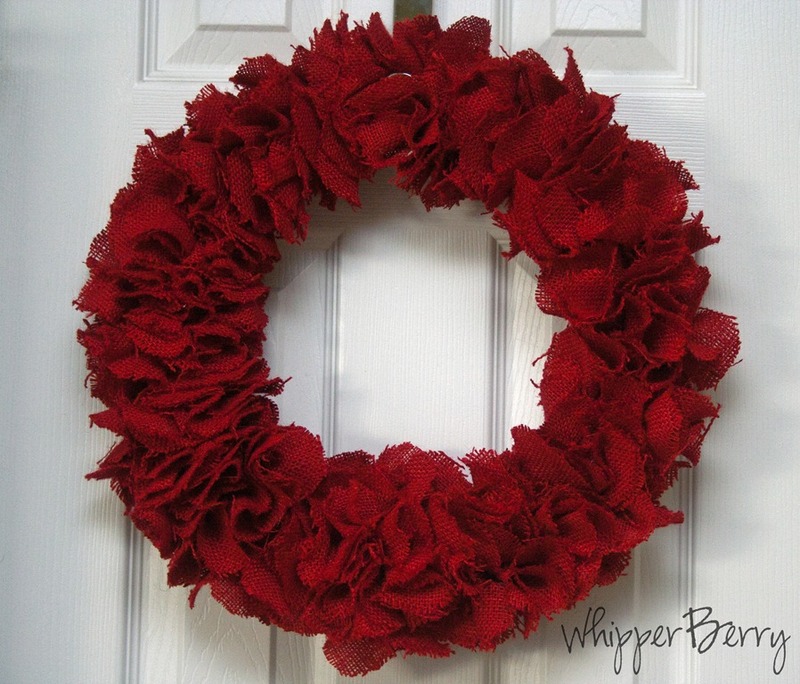 I was thinking about Valentine decorations, then, this gorgeous Burlap wreath caught my eye! Whipperberry shares a step by step tutorial on how she created this. Thank you for sharing! Wow, weren't they breathe-taking projects? I feel so blessed to see all these talents. Thank you for visiting my link party!